The great city of Baghdad, the seat of the caliph, is the brilliant centre of Islamic learning and culture. The first city-based civilization in history, the Sumerian, is appearing in Mesopotamia. The Sumerian civilization flourishes in Ancient Mesopotamia. 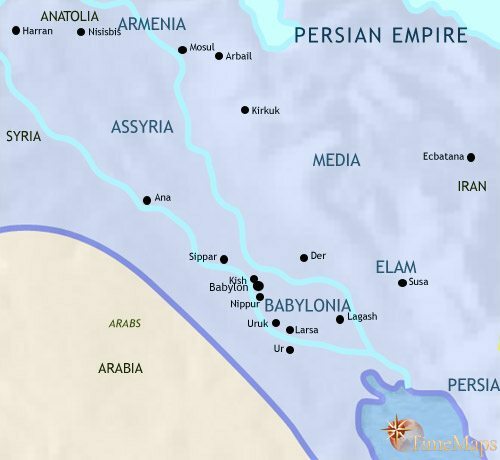 Powerful states such as Babylon and the Mitanni now rule Mesopotamia. The kingdoms of Assyria and Babylon have been greatly weakened by invasions from nomadic tribes. The historic kingdoms of Mesopotamia have now fallen under the power of the Persian empire. 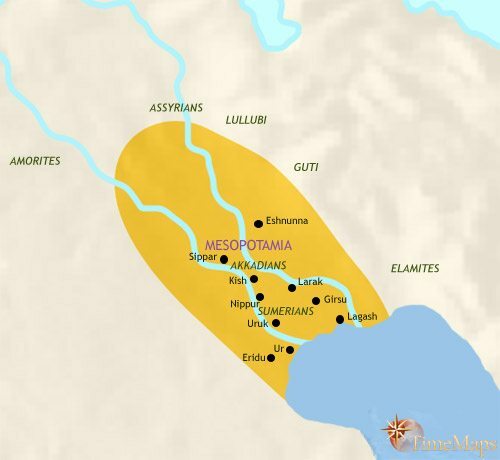 Mesopotamia is now ruled by descendants of one of Alexander the Great's generals, who plant many Hellenistic cities. Although ruled by the Parthians, Mesopotamia still has many thriving Hellenistic cities. Under Parthian rule, Hellenistic civilization in Mesopotamia gradually gives way to local influences. Under Persian rule, Mesopotamia reaches a peak of prosperity. Now under Arab rule, the people of Iraq are allowed to keep their previous religion and customs. Although Iraq continues to deteriorate, Baghdad is a major centre of Islamic civilization. Iraq is now ruled by a tribe from central Asia called the Black Sheep Turks. Iraq is now a part of the Ottoman empire. Although formally a part of the Ottoman empire, a group of Mamluq soldiers now govern Iraq as virtually independent rulers. 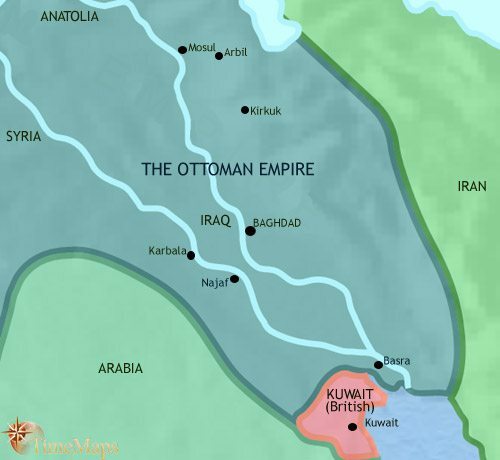 The Ottoman empire has succeeded in reimposing its authority in Iraq. 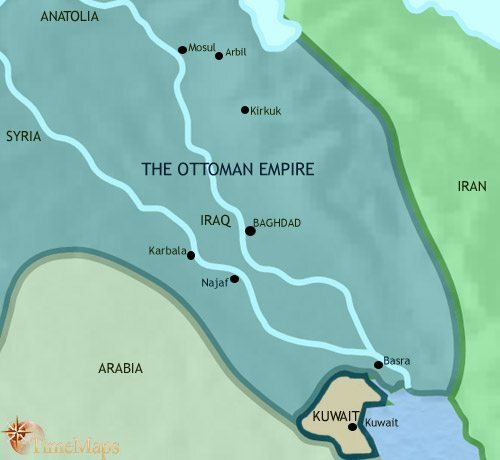 Iraq is under the firm control of the Ottoman empire. Under Ottoman rule, Iraq is modernizing. Iraq became an independent nation in 1933. Saddam Hussein's brutal rule has brought disaster to Iraq. In 762, the new ‘Abbasid caliph founded a new capital, Baghdad, which soon became one of the largest cities in the world. Iraq experienced a period of peace and prosperity. From the early 9th century, however, destructive civil wars caused a great deal of damage, to both the city of Baghdad and the surrounding countryside. The complex irrigation systems were again neglected, and large areas of land were lost to cultivation. A ferocious revolt by black slaves in southern Iraq (869-883) made matters worse, with Basra experiencing a terrible sack. Despite all these troubles, Baghdad has remained a brilliant centre of scholarship, science and culture. The fertile region of northern Iraq freed itself from Baghdad’s control in 905, under a Bedouin tribe, the Hamdanids. They are based in the city of Mosul. After 945 a group from northern Iran, the Buyids, marched on Baghdad and seized power for themselves. The Buyids have since built an empire that includes most of Iran and all of Iraq, whilst at the same time remaining theoretically subordinate to the caliphs. One of the most important developments in world history is taking place in Mesopotamia. Here, on the flood plains of the rivers Tigris and Euphrates, the fertile soil brought down from the mountains by the great rivers has given rise to much denser populations than anywhere else in the world. The arid climate, plus dangerous spring floods, has called for the creation of large-scale irrigation systems, to channel and store water for crops, and to protect communities from the raging waters. Over the centuries, large communities with densely concentrated populations of many thousands of people have grown up. These are the first true cities in human history. To help them manage the economic life of these cities effectively, the priests who control them are gradually perfecting the first known writing script and numeric system – key developments in human progress. The civilization of Ancient Mesopotamia is being built by a people known as the Sumerians. They are constructing the first urban and literate culture in world history. The past millennia has seen the Sumerians bring the civilization of ancient Mesopotamia to a high level. It has now expanded to the north, to what would later be the land of Assyria. The Sumerians have now entered the Bronze Age. Bronze is used in the weapons and decorations of the ruling classes; it is far too expensive to be used by farmers, and agriculture basically remains at a stone-age level of technology. However, the demand for copper and tin, the ingredients of bronze, means that the Mesopotamian city-states now lie at the centre of an expanding network of long-distance trade routes. Writing has reached a level of sophistication that makes it a vehicle, not only for administration, but also for the hymns, prayers and myths of the world’s most ancient literature. The small Sumerian states are constantly at war with one another, and have developed the first organised armies in history, together with the systematic taxation and bureaucracies to support them. The economic life of these city-states is highly centralized on the temples. These own much of the land (or rather, their gods do), provide work for the craftsmen and labourers, administer the cities’ markets and organize long-distance trade. Over the past thousand years, kingdoms and empires have come and gone in Mesopotamia. The first recorded empire in world history appeared briefly under the fierce Sargon and his descendants (c. 2334 to 2218 BCE), and the powerful states of Ur (2112 to 2004 BCE) followed. The civilization of Ancient Mesopotamia entered a new phase with the reign of Hammurabi, king of Babylon (1792-49E). He conquered a large empire covering most of Mesopotamia and parts of Syria. He is also famous as history’s first great law-giver. Although his empire did not endure after his death, the city of Babylon remained the primary city of ancient Mesopotamia, with the Sumerian cities being eclipsed. The history of Mesopotamian has been disrupted by periods of outside invasion and internal fragmentation. Despite these upheavals, however, styles of art, architecture and literature derived from the old Sumerian cities have retain a powerful grip on the region’s culture. 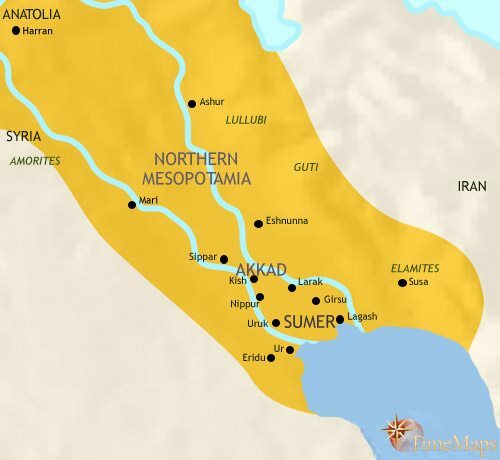 By 1500 BCE new invaders divide the ancient lands of Mesopotamia between them. 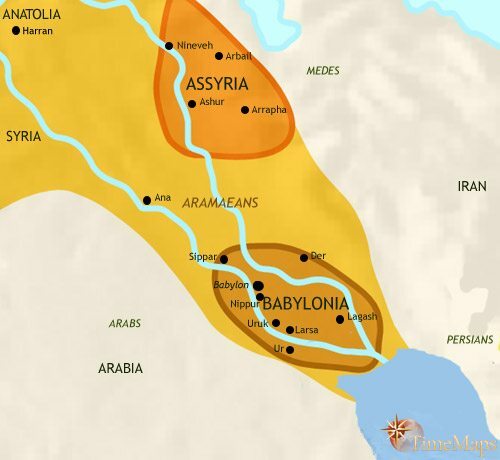 The Kassites rule Babylonia in the south, while Assyria is now part of the extensive (but short-lived) kingdom of the Mitanni. The powerful and warlike kingdom of Elam lies to the east. Despite the recent origins of these powerful states, this period represents the high point of Bronze Age civilization in Mesopotamia. The next few centuries will see great upheavals hit this brilliant world. For the past couple of hundred years the people of ancient Mesopotamia have experienced tremendous upheavals. 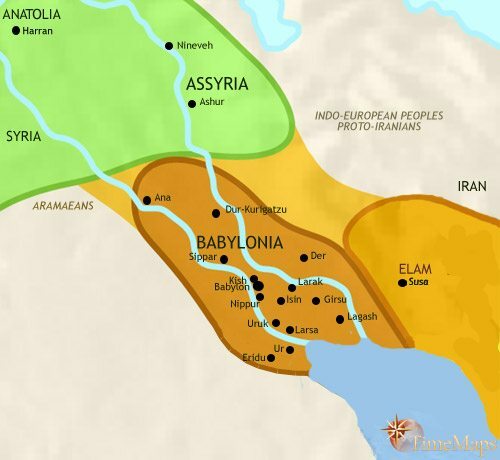 The powerful Bronze Age kingdoms of Babylonia, Assyria and Elam have been overthrown or greatly weakened by the incursion of Aramean and other nomadic peoples into Mesopotamia. 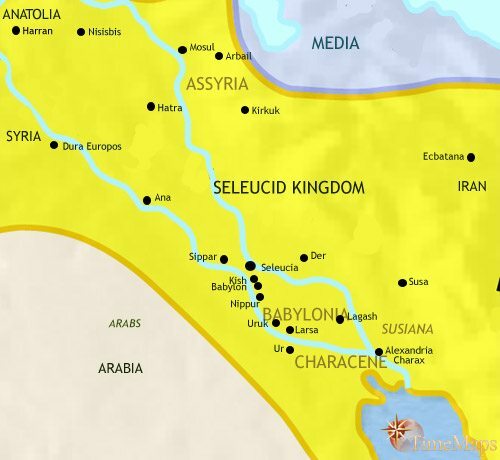 Amongst these, a semi-nomadic people called the Chaldeans have settled southern Mesopotamia, the ancient heartland of the Sumerians, and have formed a strong kingdom in Babylonia. Elam has been destroyed by incoming Iranian peoples such as the Medes and the Persians. Assyria has been hard pressed, at times almost overrun; it has only managed to survive by organizing itself along more militaristic lines. The past few centuries have seen the rise and fall of great Mesopotamian empires, first Assyria, and then Babylon. With the recent conquest of the Babylonian empire by Persians, however, the people of Mesopotamia now find themselves ruled from outside the region for the first time in their long history. The independent civilisation of ancient Mesopotamia has effectively come to an end. Its legacy, however, is still keenly felt, with the new Persian rulers adopting its art, architecture and writing wholesale. Nevertheless, the society and culture of Mesopotamia is changing. The Assyrian and Babylonian policy of uprooting conquered peoples from their homelands and moving them to other areas has caused massive population upheaval. This has led to the decline of local languages and the rise of Aramaic as the lingua franca of Mesopotamia. This in turn has led to the spread of the Aramaic alphabet. These developments make international trade easier, as do the generally high level of Persian rule and the great Persian-built roads which now span the region. Whereas the Assyrian and Babylonian periods were times of economic depression for most areas outside the imperial cores (at least, the archeaological record suggests so), the Persian period is one of prosperity for Mesopotamia. Like the rest of the Persian Empire, Mesopotamia was conquered by the armies of Alexander the Great in the 330s and 320s BCE. After Alexander’s death in 323 BCE the region fell to Seleucus, one of his generals. Mesopotamia has since been ruled by kings of Seleucus’ line, under whom a Greek-speaking ruling class has come to monopolise power. Greek-style cities – the largest of which is Seleucia-on-the-Tigris – have sprung up, settled by colonists from the Greek and Macedonian homelands. The cultural inter-mixing of Greek and native elements has led to the spread of a hybrid culture throughout the Middle East, which modern scholars label “Hellenistic”. In recent years, however, Mesopotamia has become the scene of a struggle between the Seleucid kings and an invading Iranian people from central Asia, the Parthians. These steppe nomads are gaining the upper hand. 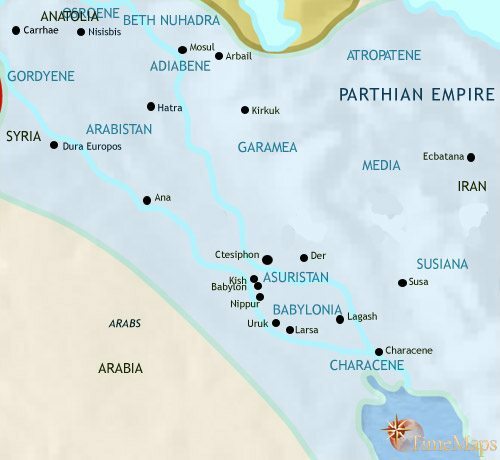 Mesopotamia has, since the second century BCE, been a part of the Parthian empire. Chronic political instability, together with the continuous wars with external foes (Seleucids, Steppe Nomads and, latterly, Romans) have prevented the Parthian kings from properly consolidating their control over Mesopotamia. As a result, several semi-independent kingdoms, only loosely subordinate to the Parthian monarchs, now cover large parts of the region, for example Characene, Adiabene and Gordyene. Most of the Parthian kings have been anxious to present themselves as pro-Greek in their sympathies. They have followed a policy of promoting “Hellenistic” civilization within the cities, and Greek continues as the international language of trade and urban culture within the empire. Aramaic is spoken by most of the rural population. The pro-Greek policies, however, are far from being universally popular amongst the Parthian ruling class. They are therefore vulnerable to changes in political fortunes, and the anti-Greek sentiments of the traditional Parthian nobility are gaining in strength. The “Hellenistic” civilization of the Mesopotamian cities has come under increasing pressure over the past two centuries. Two destructive invasions by the Romans have irreparably weakened many of the centres of Hellenistic culture, including the largest city in the region, Ctesiphon (the old Seleucia-on-Tigris). Also, a revival of Iranian culture, fostered by the Parthian empire‘s rulers, has led to the cities of the empire increasingly becoming home to a hybrid culture, which draws on both Greek and Iranian elements to create its own distinctive style of art and architecture. 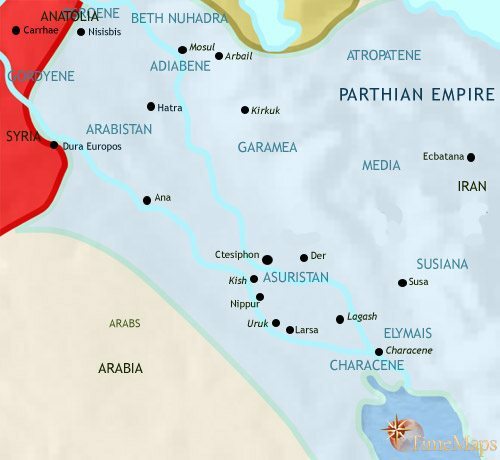 Politically, Mesopotamia has experienced increasing fragmentation, with the small kingdoms asserting more and more independence from the Parthian government. Even that part of Mesopotamia which had been directly controlled by the Parthian king, the old province of Babylonia, has now passed into the hands of local rulers. 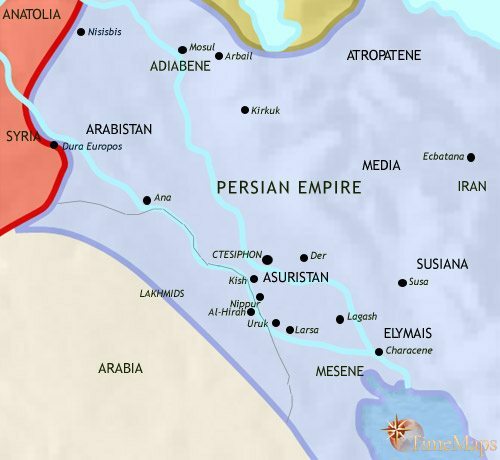 Along with other regions in the Middle East, Mesopotamia passed from the Parthian empire to the Sassanid empire in 222 CE. This Persian dynasty has created a centralized empire, and the small kingdoms which the Parthians tolerated have now come firmly under Sassanid control. As in the Roman empire to its west, new religions have spread in the region. Whilst the Persian ruling class is loyal to Zoroastrianism, Christianity is widespread amongst the population at large, and many of the cities house flourishing Jewish colonies. A new religion also makes its appearance in Sassanid Mesopotamia, that of Manichaeism. Under the Sasanian dynasty of Persia, Iraq has experienced one of its golden ages. The ancient irrigation system has been brought up to a pitch never before seen; new land has been brought under cultivation; cities have flourished, and the population has expanded. Iraq is the bread-basket of the Persian empire. Economically, the region probably attains its highest levels prior to the twentieth century. For Iraq, the last years of the Sasanian empire were marked by civil war and a dramatic deterioration in the irrigation system. A vast area of southern Iraq revert to swampland (which it remained until the 20th century). It was into this situation that Arab armies swept in and swiftly conquered the country from the Sasanians (634-8). As in other parts of the huge Islamic Caliphate, the conquered were allowed to remain Christians and keep their laws and customs. Huge numbers of Arabs did come into the country, but were settled in large garrison cities, at Al-Kufah and Al-Basra. 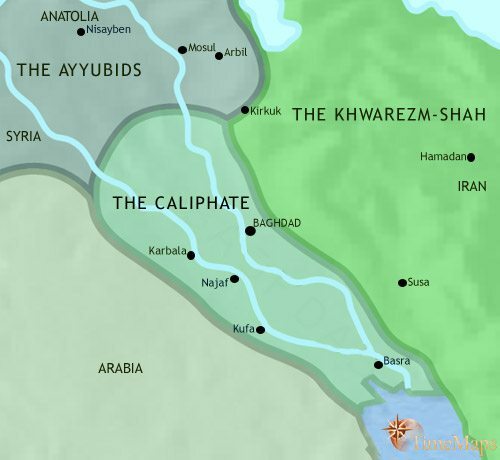 After the 660s, Iraq became a centre of opposition to the rule of the Umayyad caliphs, based in Syria. The corruption of Umayyad officials, and the neglect of the irrigation systems on which much of Iraq’s agriculture depended, led to economic depression, rising poverty and brigandage. Large numbers of Iraqi Muslims joined the Shi-ite sect, and these factors come together to give popular support in Iraq to a rebel army from Iran. In this year (750), the rebels defeat the Umayyad forces install a new caliph. He founds the ’Abbasid dynasty and chooses Iraq as his base. 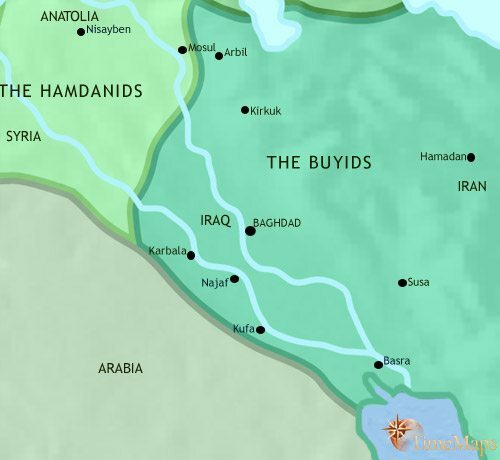 The Buyid dynasty went into rapid decline in the last years of the 10th century, losing control of all Iraq except Baghdad and its neighbourhood. Baghdad sunk into a degraded state, law and order declined to a low ebb and, in the surrounding countryside, brigandage became endemic. Yet despite all this – perhaps even because of it – Baghdad remained a vibrant cultural centre, with a free-thinking environment that firmer government control might have stamped on. After 1055, things improved greatly, as the Seljuq Turks came in and imposed order over nearly all of Iraq. Baghdad remained the city of the caliph, although real power now resided with the Seljuq sultan at Isfahan, in Iran. From the mid-12th century, Seljuq power began to decline. 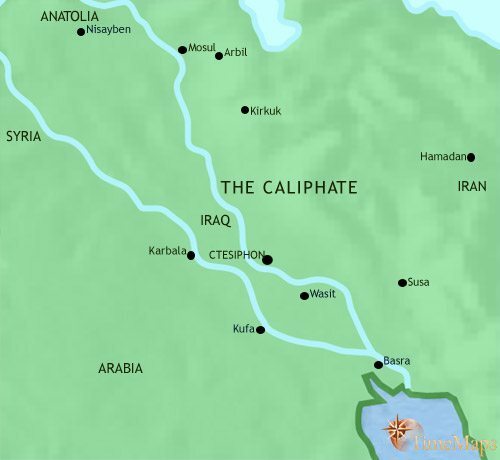 Into this vacuum, the power of the caliphs has revived somewhat: since 1160 they have gained direct control of much of southern Iraq. 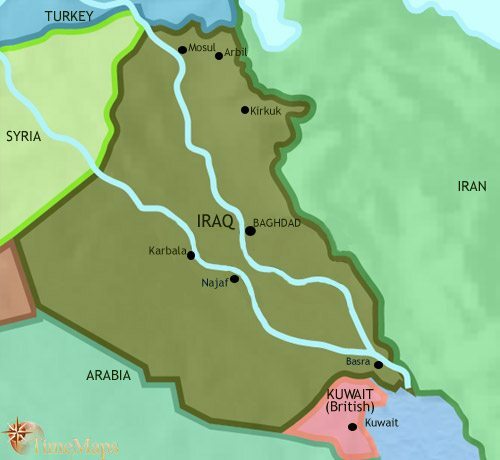 Northern Iraq is now part of a large sultanate spanning Syria and Egypt. By now, most Iraqis are Muslims, though significant Christian and Jewish communities remain; and most speak Arabic. It is now no longer the wealthiest region in the Middle East, and its population has declined considerably over the past few centuries. The Mongols invaded Iraq in the 1250’s, and in 1258 they finally entered Baghdad itself. They killed the last of the caliphs and sacked the city. Thousands of Baghdad inhabitants were massacred. 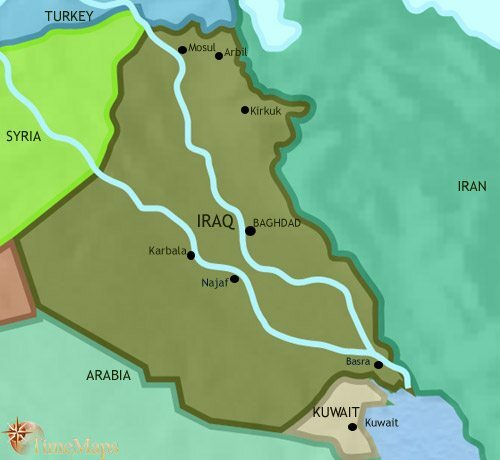 Iraq, once again, became a subordinate province of a larger empire, whose capital was far away. Under the Mongol Il-khan rulers, Iraq experienced further economic decline, with tax revenues apparently sinking to a mere one-tenth of their pre-Mongol levels. Matters got even worse when civil wars broke out between rival Il-khanid chieftains. In the chaos under the later Il-khans the Mongol Jalayrid tribe seized control of Iraq (1356). Then another conqueror from central Asia, Timur, besieged and sacked Baghdad (1401). Timur and his successors controlled Iraq for only a few years before it again passed into the hands of another group originally from central Asia, the White Sheep Turks. These are now pushing into western Iran. 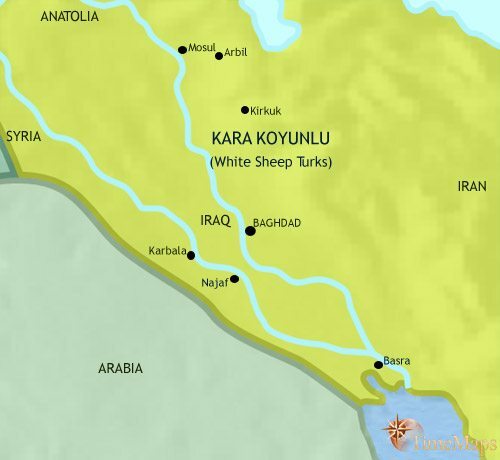 The White Sheep Turks were defeated by the Black Sheep Turks in 1467, and the latter became, briefly, the rulers of Iraq. In 1508, Iraq was conquered by the Safavids, a Shi-ite religious movement that had seized control of Iran. Then, in 1534, Iraq came under the rule of the Ottoman empire. Iraq has thus become again a subordinate province within a large empire, distant from the political hub. However, the country now knows a measure of peace and stability after centuries of political turmoil, military insecurity and economic neglect. This long period of impoverishment means that what was once the bread-basket of the Middle East now has its agriculture restricted to only a few areas, around Baghdad and Basra, with most of the country given over to a nomadic pastoral economy. In the late 17th and 18th centuries, Iraq was the scene of mounting conflict amongst the Arab tribes of the desert. 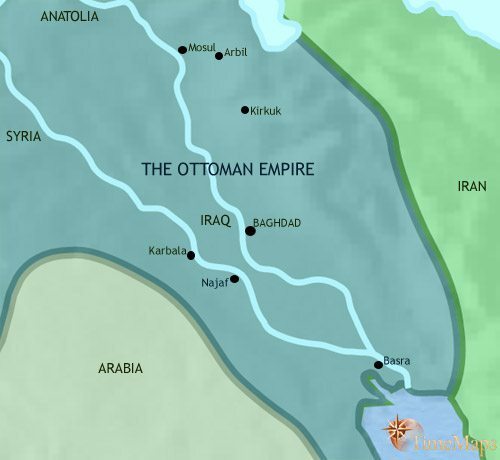 To deal with this, as well as to defend the eastern frontier against Persian aggression, the Ottomans have allowed the Pashas (governors) of Baghdad to impose order on the province using Mamluq forces, recruited in Georgia. These pashas succeeded in imposing a measure of order on the desert tribes, and in extending their power throughout most of Iraq. They paid tribute to Constantinople, but otherwise governed as independent hereditary rulers within Iraq. In 1747 the Mamluqs seized power from the pashas of Iraq. They have owed only nominal obedience to sultan. The Ottoman’s attempts to reassert effective control have been unsuccesful, and the Mamluqs behave as the rulers of an independent state. This is particularly so in their dealings with Europeans. They sign treaties with them and allow the British East India Company to establish trading relations with them. Factional strife within the local Mamluq ruling group weakened their power, and led to a progressive loss of control over the Arab tribes in Iraq. In 1801 their weakness was revealed by their inability to defend the great Shi’ite shrine of Karbala from a sack by Sunni tribesmen. Successive attempts by the Ottoman government in Constantinople to re-assert control over the country continued to fail, until 1831. In that year, however, the integrity of the empire was threatened by Mohammed Ali of Egypt, who occupied Syria. The Ottoman government in Constantinople then made a determined effort to reimpose control over Iraq by sending in a powerful army. In the following years they have been able to extend their rule throughout the entire country. Over the past decade or two, new roads have been built, a telegraphy system set up, and trade has expanded. Steamships now ply the ancient waterways of the Tigris and Euphrates. A new, more efficient provincial system has been introduced into Iraq by the Ottomans from the early 1870’s, manned by well-educated officials. As a result, the country is tied more closely to Constantinople. Local government is now in the hands of municipal and district councils. A major land reform programme has been carried through which, although of limited impact, has led to the decline of nomadism and the extension of productive farmland. This has extended government authority to areas hitherto beyond the reach of effective central government. Military conscription is now being enforced on the population. The historic city of Baghdad has received such modern amenities as a water supply system, hospitals, modern schools, paved and lighted streets, a public park, and its first bridge across the Euphrates. Textile mills, newspapers and banks have been established. A railroad network has been started. Due to its geographical distance from Europe, Iraqi society remains less affected by such European ideas as nationalism, and the country has experienced no nationalist movement against the Ottomans of the kind that has appeared in Syria. With the Ottoman empire joining the central powers in World War 1, Iraq was occupied by British forces. After the war, the country became a British Mandate territory on behalf of the League of Nations. The British set up a constitutional monarchy, under king Faisal I (reigned 1921-33), with an elected parliament. Iraq became independent in 1932. Sadly, politics became increasingly faction-ridden, which led to an army coup in 1936. From then on the army dominated politics until World War 2. The economy continued to expand; irrigated farmland was extended, oil revenues became an important source of revenue, and the railway network was completed. In World War 2, the country was again occupied by the British after a pro-Nazi coup threatened British positions in the Middle East. A series of weak, short-lived civilian governments held power, but still managed to preside over much economic progress. This was largely thanks to a non-political but powerful agency known as the Development Board, which oversaw economic development. In 1958, the king, Faisal II, was assassinated in a coup led by al-Karim Qasim, and a republic was declared. Continuing political instability led to a coup in 1968 which brought the Ba’ath party to power. In 1979, Saddam Hussein became president. He immediately consolidated his power by an extensive purge of opponents, inside and outside the Ba’ath party. At the end of the 1970s, deteriorating relations between (secular, Sunni-led) Iraq and (religious, Shi’ite-led) Iran led to the Iran-Iraq War, one of the longest and bloodiest conflicts of the later 20th century (1980-88). This was not long ended (in stalemate) when, in 1990, Iraq invaded Kuwait. The short, sharp First Gulf War that followed ended in heavy defeat for Saddam Hussein at the hands of a massive American- and Saudi-led coalition. Continuing tensions, mainly over the issue of his supposed stock of Weapons of Mass destruction, together with his oppression of Kurds and Shi’ites, led eventually to the Second Gulf War in 2003. In this, American and British forces toppled Saddam’s regime. However, this war was followed by a period of dreadful chaos. The general elections for a Transitional National Assembly in 2005 began the slow road towards some normality. One of the great civilizations of world history, that of Ancient Egypt, is taking shape in the Nile Valley. By this date Ancient Egypt has developed one of the great civilizations of world history.